"I'd rather be playing music"! And so we do, Ellen & I, ... as much as our lives as parents of five boys will allow. 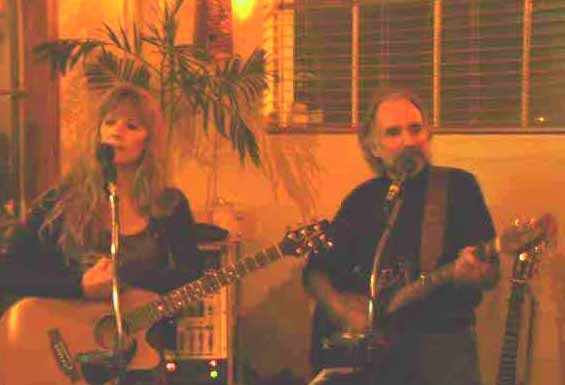 Based in Corvallis, Oregon we have long been active in our local and regional music scene. Our genre of music would best be discribed as acoustic folk, with a hint of country-blues and a taste of technology here and there. Listed below are the recordings we have available for order. Click on the titles for more information (some ancient photos). and a quick listen to some of the tunes on MP3 demos . We are currently working on three recording projects; a three song CD called "An Oregon Trilogy"; a full album called "The Heartstone"; and a collection of traditional Christmas Carols. "AN OLD VOLVO", a CD single by Tom & Ellen featured on NPR's Car Talk with Click & Clack (show #113). "THE TOUCH", a CD by the two of us of all original Christian tunes released 4/2000 to finance our cross country "Pass The Hat Tour 2000". "LIVE...IN THE LIVIN' ROOM", a solo CD of Tom doing a bunch of his original folk tunes. These were recorded with no overdubbing, on cassette, in the living room more than few years ago. "LIFE HIGHWAY" a CD single inspired by an old red '52 Chevy Pickup. I hope you'll hear this on NPR's Car Talk in the fairly near future if it passes the scrutininy of the Car Talk "Auto-musicologist'. Don't get shocked by the picture on the cover! "THE YEOMEN" This CD is a real trip down memory lane! In the far away land of New Jersey there once was a folk group calling themselves first The Wayfarers, then The Yeomen. This disc is an archive of tapes of a couple of their performances in the mid -'60s.